The health of our rivers, creeks and wetlands is often influenced by activities on the land. To survive and thrive, native fish need clean water, shelter, food and room to move. Maintaining or improving these elements for fish, while still ensuring the floodplain is viable and productive, is a complex challenge. Undertaking activities that result in healthy rivers, will also help create healthy farms. Activities such as native tree planting, controlling stock access to waterways and managing weeds will improve water quality, stabilise streambanks and reduce erosion, whilst also increasing farm productivity, improving farm infrastructure, reducing stock loss, and improving the value of your farm. Funding is available through the Australian Government’s Clean Energy Future Biodiversity Fund to assist landholders make on-farm improvements and help the Namoi River and its fish. Fencing to manage stock access to the riparian zone is one way to improve river health. Photo: Milly Hobson. The Namoi Biodiversity project will improve river health and connectivity through the management of riparian and wetland areas along a priority 150km reach of the Namoi River between Gunnedah and Narrabri. controlling woody weeds, such as Willows, Ossage Orange and Honey Locust. These activities will improve the connectivity, abundance and distribution of native flora and fauna in the Namoi, whilst also looking after our land for future generations. The Namoi River between Gunnedah and Narrabri has been identified as a key aquatic asset for inland NSW, providing critical habitat for significant native fish biodiversity and threatened species. 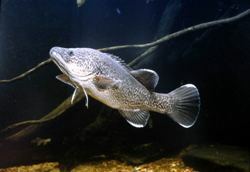 The majority of Murray Cod are found close to snags. Photo: Gunther Schmida. Threatened species found in the Namoi River include the Murray Cod; Purple Spotted Gudgeon; Silver Perch; Olive Perchlet; and Freshwater Catfish. This stretch of the Namoi River is also in close proximity to areas included in the National Reserve System and forms part of the Aquatic Endangered Ecological Community of the Lowland Catchment of the Darling River. These attributes highlight the high conservation value of the reach and emphasise the need to restore and protect the riparian zone along the Namoi River. Riparian land acts as the last line of defence for the waterway, helping to stabilise banks, improve water quality, drive food webs, and provide habitat, all of which is vital for the recovery of threatened aquatic and terrestrial species in the area. For more information contact Milly Hobson (milly.hobson@industry.nsw.gov.au) or by telephone on (02) 6763 1206.